Athletic trainer Barry Jones and junior defender Laurence Fairchild celebrate after Jones puts a penalty kick into the upper 90 over the goalkeeper. 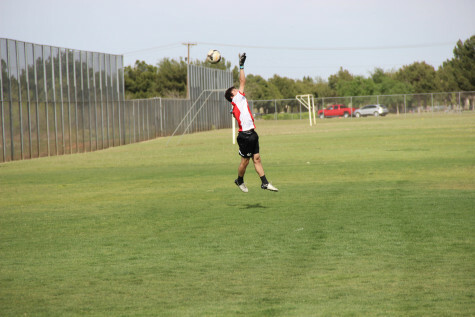 After the six hour trip to Midland, the Cowboys stopped for a quick training session before their game on Friday at 4 p.m.
Senior goalkeeper Jerod Longoria goes up for a shot in the Cowboys’ training session in Midland, Texas. After traveling all day, Coppell practiced at Audrey Gill Sports Complex to prepare for Friday’s regional semifinal against El Paso Socorro. 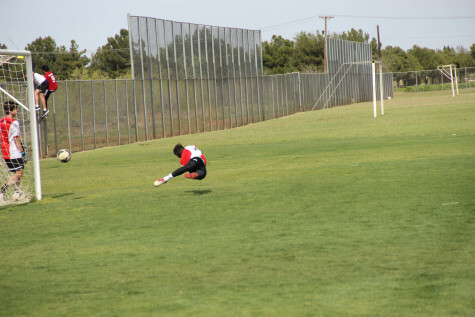 Sophomore goalkeeper Jose Haro dives for a ball in Coppell’s practice on Thursday, April 7. 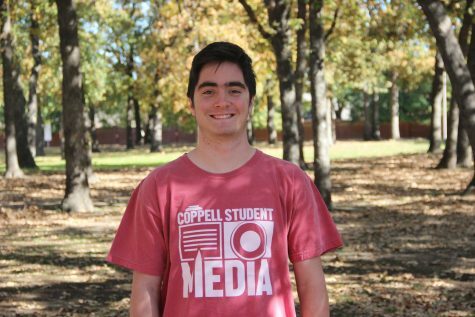 In the practice, Haro and the Cowboys worked on long passes, set pieces and penalty kicks in preparation for their game on Friday in the regional semifinals. 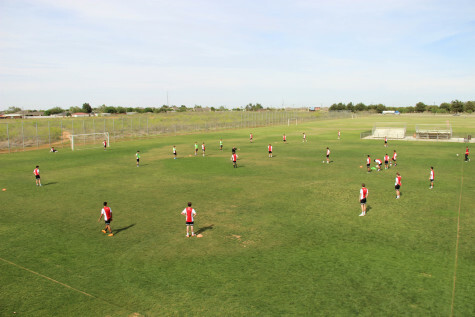 The Cowboys soccer team practices at Midland’s Audrey Gill Sports Complex on Thursday, April 7. In the practice, Coppell ran several drills in preparation for Friday’s game against El Paso Socorro. Senior defender Brandon Bohn strikes the ball in a drill in the Cowboys’ practice on Thursday, April 7 in Midland, Texas. 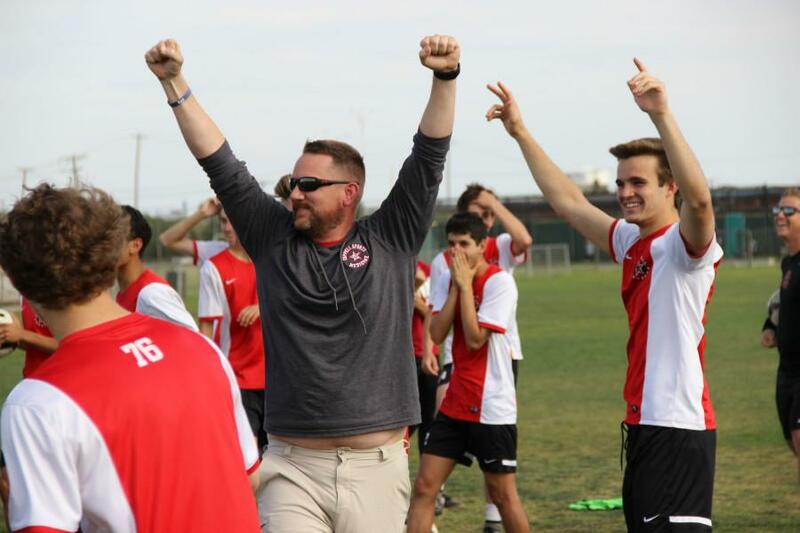 After defeating the McKinney Boyd Broncos 4-1 in the regional quarterfinals, Coppell faces El Paso Socorro on Friday, April 8 in the Regional semifinal at Grande Communications Stadium. 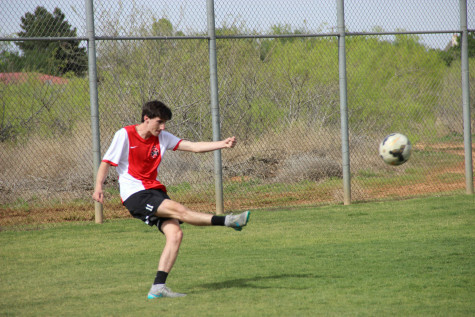 In Coppell’s practice on Thursday, April 7, coach Chad Rakestraw takes a penalty kick as the team looks on. Rakestraw has led this team to a 20-0-2 record thus far and their second regional tournament berth in three years. Coppell coach Chad Rakestraw headers the ball to himself while the team takes penalty kicks in their practice on Thursday in Midland, Texas. Rakestraw and the Cowboys trained for an hour in a half in preparation for their regional semifinal matchup with El Paso Socorro.